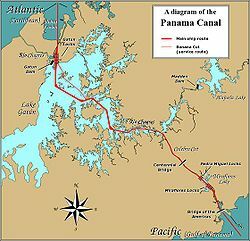 The Panama Canal is a waterway (a canal) in the country of Panama in Central America, that connects the Atlantic Ocean and the Pacific Ocean. Because of the way Panama twists, the entrance to the Pacific Ocean is farther east than the entrance to the Atlantic Ocean. This is the opposite of what one would expect. The Panama Canal is 77 km (48 miles) long and cuts across the Isthmus of Panama. At each end it uses three pairs of locks for lifting and lowering ships on different water levels. This saves ships 15,000 km (10,000 miles) compared to going around South America. Each year, about 14,000 ships come through the canal. By 2002, around 800,000 ships came through. The old locks are 110 ft (33.53 m) wide by 1,050 ft (320 m) long and 41.2 feet (12.6 m) deep, with a usable length of 1,000 ft (305 m). The biggest ships that can go through the Panama Canal are called Panamax. New locks opened in 2016 to allow ships more than twice as big, called New Panamax. They are 55 m (180 ft) wide by 427 m (1,400 ft) long, and 18.3 m (60.0 ft) deep. New channels connect to the new locks. Ferdinand de Lesseps tried building a Panama Canal in 1880, but couldn't finish it. The project was started again in 1904 by the United States, under the presidency of Theodore Roosevelt, who spent ten years and 375 million dollars building it. The Panama Canal was finally finished in 1914, but at the cost of approximately 25,000 lives. This page was last changed on 18 April 2019, at 17:44.